The Regional Plan Association has released a new plan to beef up bus and train service for L train riders who’ll need robust transit once the western part of the line shuts down for Sandy-related repairs. “Fixing the L Train and Managing the Shutdown” [PDF] includes concepts that have been floated before, like a 14th Street transitway, while adding new details like a full service plan for buses replacing L train service. DOT and the MTA, which have remained tightlipped about their intentions and alarmingly reluctant to cooperate, will need to team up to implement these ideas and keep hundreds of thousands of people moving. 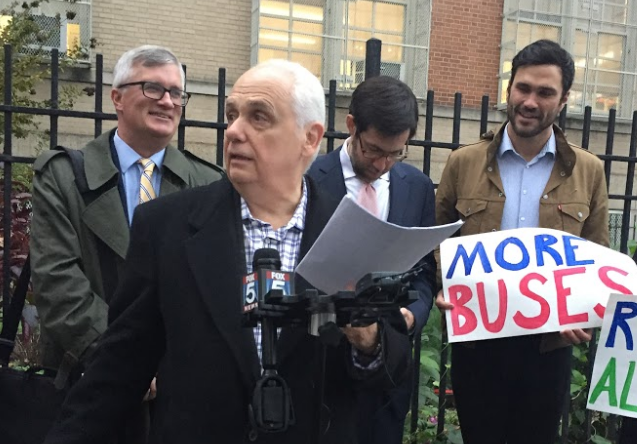 At a press conference yesterday, three local elected leaders — Assembly members Joe Lentol and Brian Kavanagh and State Senator Daniel Squadron — said they support the RPA plan. The ideas in the report are anchored by the goal of ensuring that displaced L riders are not relegated to a three-seat subway-to-shuttle-to-subway ride. That means providing direct BRT service to job centers in Midtown and Lower Manhattan, ensuring the shortest possible trip times to other destinations in the city, and adding capacity on nearby subway and Long Island Railroad lines. 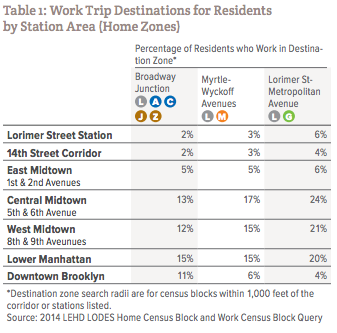 On the Brooklyn side, the bus service would begin at the Lorimer Street-Metropolitan Avenue train stations, where riders from the L and G could transfer to one of four Select Bus Service routes that would connect to existing bus lanes on First and Second Avenues via dedicated lanes in Brooklyn and on the Williamsburg Bridge, Delancey Street, and Allen Street. From First and Second Avenue, buses would head to four areas: Midtown East and Lower Manhattan, Midtown Central via new bus lanes on Fifth and Sixth Avenues, and Midtown West via new bus lanes on Seventh and Eighth Avenues. Buses would travel crosstown via a car-free transitway on 14th Street. The plan also recommends building out the protected bike lane networks of affected neighborhoods, increasing capacity and frequency on the M, G, and A/C lines, opening closed entrances to stations along those lines, and providing a lower fare for LIRR riders traveling within the city on the Atlantic and Port Washington branches. RPA presented its proposal publicly for the first time last night at a public forum held at Automotive High School in Williamsburg. Overall, attendees were open to and interested in the proposals. Without word from DOT or the MTA, they’re stuck waiting anxiously for answers. Speaking before the forum, Lentol, Kavanagh, and Squadron expressed support for the RPA recommendations. “The ideas that we have today from RPA and the Riders Alliance are exactly the kinds of ideas that the MTA — the city, and the state — need to be looking at ahead of time, transparently, to figure out the best way to get people around during the closure,” Squadron said.